WordPress is the most popular CMS in the world today. Since its advent in 2003, it has grown to become the largest self-hosted blogging tool used by millions of websites with millions of views every day. In Nepal, however, WordPress was relatively unknown till a few years later. These days, many people are aware of the WordPress Nepal community and it is growing stronger each day. However, it wasn’t always so. In Nepal, things usually get noticed only after the international success is huge. Even if the information is out there, people are reluctant to invest in it given the Nepali society’s ideology that one shouldn’t take risks. We are much preoccupied with stressing out over social, familial and financial security that big steps are very negligible. Even if someone takes them, it is with a huge degree of caution and reluctance. There were a few who were willing to take that risk and dive into the WordPress realm and who we have to thank for the WordPress Nepal community which we are a part of today. They are Sakin Shrestha, Chandra Maharzan and Ujwal Thapa. They had the foresight that WordPress would be a success in our IT sector and had the courage to leap beyond the societal norms. Of course, as with all other success stories, this one started with a single step as well. It began at Digital Max Solutions, an outsourcing company that created websites using Joomla, Drupal, phpNuke and custom content management system. But there were a lot of problems. The platform they used was not fast and very unstable. Chandra had been familiar with WordPress since 2005 and in 2007 that Sakin suggested of making the change. Upon discussing it with his colleagues, they were quite reluctant as they thought it to be mostly for blogging only. So, Sakin took it upon himself to work on weekend projects. He used his leisure time to create a website digital.com.np in WordPress. Upon seeing the development, everyone was really impressed and agreed to make the change. Thus, in 2007, 4 short years after WordPress was born, the first WordPress users for commercial web Development in Nepal were born. Previously, they thought that WordPress was only limited to blogs. But the misconception was waived off and they started using it as a CMS for all website types. They began developing new websites and also making new themes. Then in 2011, in what was actually a family vacation trip to Melbourne, Sakin had an opportunity to attend WordCamp Melbourne. It was there that he saw all that WordPress was and all that it could be in a country like Nepal. That was where his plans for releasing themes and giving back to the community arose. Likewise, in the same year, Chandra Maharzan attended the WordCamp San Francisco 2011 and he too came back with a similar mindset. There were just three founding members of WordPress Nepal—Sakin Shrestha, Ujwal Thapa and Chandra Maharzan. They planned to work on spreading WordPress and started organizing meet ups. The first WordPress Nepal Meetup was a casual meeting of the three of them grabbing a cup of coffee each. Following that they started forming a group, sending invites to their contacts to join them. They previously worked from home. Slowly the number of people in the meetup increased to 10 attendees. They still kept it casual and not very work focused. They just wanted to attract a larger crowd first. Good strategy they applied, it seems. They organized various College events to bring students’ interest to the WordPress arena. But for the WordPress Nepal community to have reached the status it is in today, they required professionals. So, they used their great networking skills. Facebook was the most used social networking platform and they put it to its best use. Finally, they successfully converted existing IT professionals to WordPress enthusiasts. Henceforth, in 2012, the first WordCamp Nepal happened. Albeit being the first WordCamp in Nepal, it boasted an attendee number of over 130. 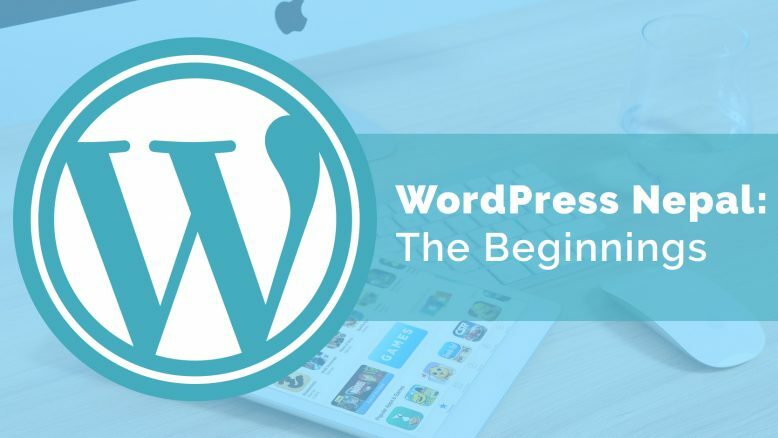 More people came to know about WordPress and thus the network expanded exponentially. Post that, there have been regular annual WordCamps in Nepal. Every year the outreach is increasing and people are getting to know WordPress for its worth. WordPress Nepal community is still increasing and expanding its outreach. It is touching lives of Nepalese in the IT sector in a way that enables them to become successful individuals in their sector. WordPress, being open source, has allowed for everybody to be a part of the movement. WordPress encourages the participants to want to give back to the community what they have received and this kind of an encouragement is crucial to a rapidly developing community like ours. The next WordCamp has moved on to become WordCamp Kathmandu, Nepal 2016. It only increases the global outreach from local spaces. We can hope WordPress to soon reach more commercial sectors and government offices in our country. We are fortunate to have WordPress and WordPressers for nearly a decade in Nepal. We can only hope to make it bigger, aspire to expand the horizons and always give back to the community. You can read Sakin Shrestha’s WordPress journey in his own words here, an interview with Chandra Maharzan here and Ujwal Thapa’s WordPress testimonial here.